Bill Sarver was a young outfielder drawing comparisons with the great Joe DiMaggio. But military service in Europe would see his life end just one month before the war against Germany ended. 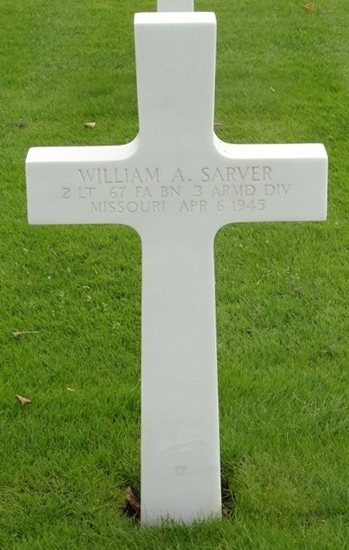 William A. Sarver was born in Kansas City, Missouri, on January 31, 1920. He attended Central High School in Kansas City where he was recognized as an outstanding baseball player. At the age of 17, and making a name for himself playing third base for Lapetina of the Ban Johnson League, Sarver attended a New York Yankees tryout camp. There were 500 attendees at the camp; Sarver and future Yankees catcher Ralph Houk were among the seven who received a contract with the American League club and he was assigned to the Joplin Miners of the Western Association. 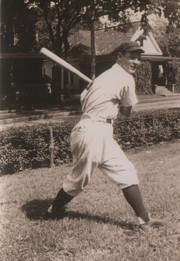 Sarver joined the Neosho Yankees of the Class D Arkansas-Missouri League for 1938. He got off to a slow start and by mid-June he was batting only .192 (15 for 78) and had a fielding percentage at third base below .800. But as the summer progressed the youngster found his stride and finished the season batting .254 over 94 games, although he made 41 errors. In 1939, Sarver was back with Neosho, and manager Dennis Burns, who was with the Philadelphia Athletics in the mid-1920s, moved the fleet-footed 19-year-old to center field. He responded by hitting .284 in 123 games and led the league with 40 doubles and 48 stolen bases. Teammate Ralph Houk also had a strong season batting .313 and playing solid defense behind the plate. Sarver began 1940 with the Akron Yankees of the Class C Mid-Atlantic League but was optioned to the Amsterdam Rugmakers of the Class C Canadian-American League on May 4. He made an immediate impact the following day in a pre-season exhibition game at Mohawk Mills Park. Playing in right field against Ithaca College, he hit a triple and handled three chances, one a difficult catch up against the outfield fence. Both offensively and defensively he continued to impress. "If you know of a smoother all-around performer than Bill Sarver, the Rugmakers' centerfielder," wrote sports editor Jack Minnoch of the Amsterdam Evening Recorder in June 1940, "we have our best ear cocked to catch the name." By July, he was hitting .333 (seventh best in the league), although he tailed off as the season progressed and finished the year with a .287 average, 10 home runs and 67 RBIs over 119 games. He was optioned to Norfolk of the Piedmont League in September, but began the 1941 season with the Augusta Tigers of the Class B South Atlantic League. Sarver was only with the team for a little over a month but that time resulted in a reunion with Ralph Houk, and the young catcher introduced Sarver to local girl Marian Smith. They married in Kansas City on December 8, 1942. Sarver joined the Akron Yankees of the Class C Mid-Atlantic League in late May but failed to hit consistently - batting just .210 in 54 games - and found himself back with the Rugmakers for the latter part of the season where he batted .226 over 41 games, but received honorable mention on the Canadian-American League all-star team. Sarver was 21 years old and had completed four seasons in the minors. But his career was now on hold as he entered military service with the Army on November 3, 1941. 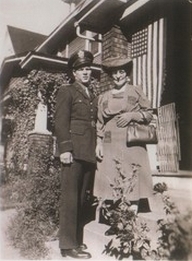 Initially stationed at Fort Bragg, North Carolina, Sarver was selected for Officer Candidate School at Fort Sill, Oklahoma, and was commissioned a second lieutenant in November 1942. In January 1945, Sarver bid farewell to Marian and his young daughter, Kathleen (William, a son would be born in September 1945), and departed for Europe with the 67th Field Artillery Battalion, 3rd Armored "Spearhead" Division. The division broke through to the Rhine River and captured Cologne on March 7, 1945. Two weeks later it crossed the Rhine and moved north to capture Paderborn on April 1. The 3rd Armored then pushed on against disorganized resistance. On April 6, 1945, Second Lieutenant Sarver was serving as a forward observer when he was killed by small arms fire. He was buried at the Netherlands American Cemetery in Maargraten, Holland. Sarver was posthumously awarded the Silver Star, which was presented to his wife and children at Fort Gordon, Georgia. Thanks to Robert, Don, Mary, Eleanor and Patricia Sarver for their help with this biography. Thanks, also, to Bill Sarver, Jr. Thanks to Astrid van Erp for help with a photo for this biography.